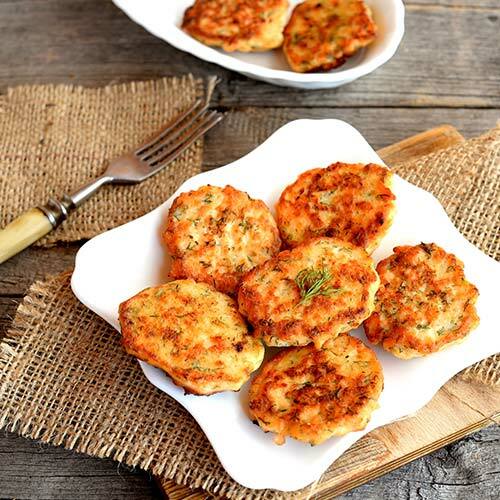 Spice up your Good Friday fish dinner with delicious fish cakes! Tasty and crunchy, they’re a perfect gluten and dairy-free alternative served with fresh salad and a squeeze of fresh lemon. 1. Bring a large saucepan of water with a pinch of salt to the boil. Add potatoes, bring to the boil, then turn heat down and simmer for 10 minutes or until cooked through. Add peas for the last 2 minutes. Drain and cool. Add back to the pan and mash well. 2. Add chives and salmon to a mixing bowl, forking into smaller chunks. Add lemon zest and flour, then crack in the egg. Add mash, then mix until combined well. Season with salt and pepper. Divide into 8 fishcake shapes, roughly 2cm thick. 3. Heat olive oil in a large frypan over medium heat. 4. Add each fishcake to a floured plate, coat on either side then carefully place into the pan and cook for 3-4 minutes on each side or until golden. Use the rest of the lemon for its juice to squeeze over fishcakes, serve with salad and enjoy!